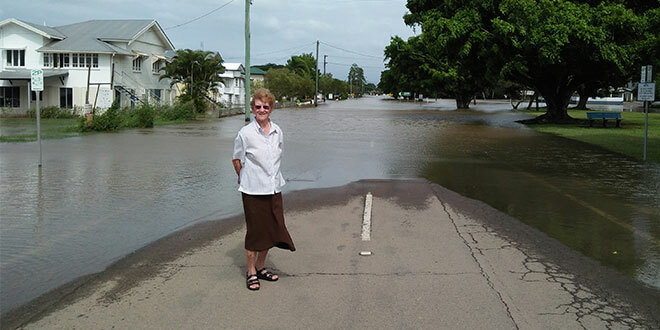 Roads cut: Sr Nina Barra surveys the floodwater in Ingham. NORTH Queensland is recovering after major flooding cut roads, closed Catholic schools and caused major property damage. Hardest hit was the town of Ingham, where a muddy clean-up of homes and businesses was underway after floodwaters swept through town, with authorities issuing a warning about crocodiles and snakes. “We’re cut off north, east and west still, but the centre of town is all above water now,” Ingham parish priest Fr Damian McGrath said after days of heavy rain. While St Patrick’s Church in Ingham was able to hold Sunday Mass, regional parishes were cut off and forced to cancel Mass. Five Catholic schools were among more than a dozen schools and early-childhood centres forced to close as parents were urged to check local weather conditions and road access “and place the safety of their children above all else”. At St Teresa’s College, Abergowrie, in the Herbert River valley about 38km from Ingham, about 200 boarding students were high and dry, but the college was cut off. Many of the students are from remote indigenous Australian communities of the Northern Territory, Cape York and the Torres Strait as well as some from Papua New Guinea. Townsville Bishop Tim Harris said the people of the Ingham district were “in our prayers these past few days”. “The community are no strangers to weather events like this, so they are prepared and have spirit to carry on and repair any damage caused by these floods,” Bishop Harris said. More than 700mm of rain fell in four days in a number of catchment areas, with The Boulders, south of Cairns, receiving 1009mm in the seven days to 9am Saturday. In Townsville diocese’s far west, Carsland, near Mount Isa, received 298mm on March 10, smashing a daily record set in 1957. Trepell Airport, south of Cloncurry, received 171.8mm on one day, more than double the previous March record of 75.8mm. More than 70 state school students and staff stranded for six days at an adventure camp near Tully were evacuated, after authorities managed to get troop carriers into their location and drive them to Tully airport before flying them to Townsville. Locals also reported dangerous wildlife in the region thanks to the wet weather, with sightings of bull sharks, spiders and snakes, and one report of a crocodile lunging at a four-wheel-drive vehicle. Ingham resident Rhonda Brown came across a crocodile on her way home from work and posted a photo on Facebook of the large reptile with one front leg missing – a warning to locals to beware of the dangers lurking in the floodwaters. Fr McGrath, who has spent more than nine years as parish priest in Ingham, said North Queenslanders were resilient in the face of natural disasters. “Floods are so normal here,” he said.